"Acts of cruelty against animals are now counted alongside felony crimes like arson, burglary, assault, and homicide in the FBI’s expansive criminal database." This is truly excellent news... I've been fighting for animal welfare around the world for the past 40+ years, and there are times it feels like nothing will ever change for the better. But, but, but... no matter how frustrating and heartbreaking it can be, we must keep campaigning, funding the activists fighting at the coalface of cruelty and torture, and doing whatever we can to make the world a better, kinder place for all living creatures. *Note* The proceeds from sales of anything on this site go towards making contributions for the many organizations that I support, so when you buy from links in this site, you know any commissions earned will actually be going to help improve animal welfare worldwide. 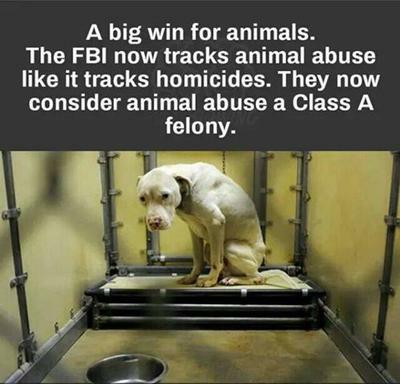 Quote from FBI site: "By adding animal cruelty offenses to NIBRS, law enforcement agencies and the advocacy groups that pushed for the inclusion in the FBI database are hoping the results will reveal a more complete picture of the nature of cruelty to animals." This news is about the American law agencies taking a stand on animal abuse, and I welcome the day that every National/Federal law agency in the world takes the same view of animal mistreatment. Quote from FBI site: "The National Sheriffs’ Association was a leading advocate for adding animal cruelty as a data set in the Bureau’s collection of crime statistics. The association for years has cited studies linking animal abuse and other types of crimes—most famously, murders committed by serial killers like Ted Bundy, Jeffrey Dahmer, and the “Son of Sam” killer David Berkowitz. The organization also points out the overlap animal abuse has with domestic violence and child abuse." There are many wonderful organisations that fight to end animal abuse, and I'll be loading more links on the site once I create a site Guide on the topic, so that you can select some to begin working with and supporting their projects. I'm a firm believer in Compassion Through Action. “It's not our job to toughen our children up to face a cruel and heartless world.